Kate Douglas Wiggin (1856-1923) was a pioneer of the kindergarten movement in the United States in the nineteenth century. She helped to establish the Silver Street Kindergarten in San Francisco in 1878, the first free kindergarten in California. She also co-founded the California Kindergarten Training School for aspiring kindergarten teachers in 1880. In addition to kindergarten training and advocacy, Wiggin was a prolific author of books for children, including the well-known Rebecca of Sunnybrook Farm (1903) and Mother Carey's Chickens (1911). Wiggin also published a number of works on kindergarten theory and method as well as fiction for adults. 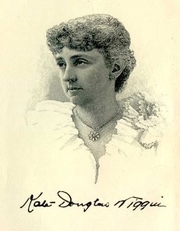 Kate Douglas Wiggin is currently considered a "single author." If one or more works are by a distinct, homonymous authors, go ahead and split the author. Kate Douglas Wiggin is composed of 37 names. You can examine and separate out names.